Work- life balance is a concept that pertains to creating a balance between work and personal life. There is some truth in the common saying that “All work and no play makes Jack a dumb boy”. So no matter how much you want to climb the ladder of success you should ensure that you are not missing out on another part of your life because later on, you might end up regretting it. Money is important to live a comfortable life, yet it is not the be all and end all of life. Many years from now, when you look back on your life, it is not the amount of money you have that is going to be a testimony but how much you lived your life to the fullest will be. Life should be made up of both memories and experiences. Here are some of the best ways to achieve a better work-life balance such that you receive the best of both worlds and miss out on nothing. 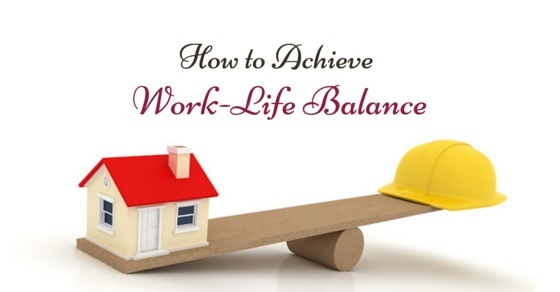 The following mentioned are few tips for life management and how to achieve work-life balance. In order to strike a proper balance between your work and your personal life you should ensure that you do not bring your domestic woes and share it with your colleagues or your seniors. When you do something like this it not only creates a bad impression but it silently communicates that you do not know how to conduct yourself in a professional manner. Similarly, you should not constantly have to complete your pending work at home. Once in a while it is all right to have a little work to complete at home but doing so on a daily basis isn’t a good thing. Once you reach home, no matter how tired you are, you should spend some time with your family, ask them about how their day was and tell them about your day as well. Engaging in conversations like this really helps to bring the family closer together. A good way to create a work-life balance is by concentrating on what you are doing. If you are at work then make sure that you keep focusing on what you are doing. A job that is likely to be completed in an hour or so could take up to seven or eight hours if you keep getting distracted and wasting time talking to colleagues or using your phone. Similarly if you are at home then should not be focusing on office work. There is no point being physically present and mentally absent because that defeats the purpose entirely. When you focus on a task then you not only complete it in a short span of time but you are able to produce top quality work. You boss will appreciate your work ethic when he sees the tremendous amount of focus and hard work you put into your projects. The importance of work-life balance policy is very vital. Most people make the mistake of focusing too much on merely one aspectofn life and this comes back to haunt them later on in life as they end up having so many regrets. Building a career for yourself is important however you should try and take out some time from your busy schedule to spend with your family. Yes it’s true that your family is always by your side willing to make sacrifices for you and they even understand that sometimes you might be too busy to make it to lunch and dinner outings with them but in the years to come you might realize for yourself that you have been missing out on so much. In addition to taking out time for your family it is important to take out time for yourself. Having a little ‘me’ time could really help you gather your thoughts and gain insight into things. Money can buy you a lot of materialistic things but it can never buy you happiness and that is one thing you should try and remember at all times. So balancing work and life skill should be possessed by every individual. One way of creating a work and life balance is by making sure you love your work. Very often people take up a particular profession because their parents want them to do so, but their own interests and talents do not lie in that field. No matter how much you love your parents and want to make them proud, you should ensure that you are not doing so at the risk of your own happiness. At all times you should ensure that you listen to your own mind and follow the dictates of your own heart. Even if the profession you want to choose is not a very lucrative one it will at least bring you fulfillment and joy. When an individual does not love his or her job then work becomes a strain, burden as well as a source of great stress. However when you are in love with your work then you are able to live a stress free life and even come up with new and innovative ideas. Taking on a fun hobby is the kind of thing that helps you balancing life and work or create a good work-life balance. You must ensure that your hobby is not something that stresses you out a lot instead it should be something that is fun and doesn’t involve you thinking at all. Zumba, Rumba, Painting, Salsa, Cookery, Wine Making and even Singing are some of the most common classes that people opt for. In addition to having a great deal of fun you also end up learning something new and making many memories. Everyone has their own likes and dislikes but dance classes have proved to be most successful in helping to relieve stress and helping people bond with one another. One of the easiest ways to set a balance in life and work balance is by simply being organised at all times. Organized people not only get things done in a shorter span of time but they are also able to produce quality work. Whether it is pertaining to your household or office obligations you should try your best to be methodical in whatever you do. Disorganized and haphazard people find balance, extremely tough to juggle their personal and professional life so they end up being flustered and confused. This does not imply that you have everything figured out and be sad when things do not go your way; it simply implies that you attempt to put those things in order, which you can. Most often in the attempt of achieving career goals, people end up losing focus of what is really important in life. Being career oriented is good but not very worth it when it comes at the cost of missing out on every family vacation or occasion. Just remember that there are many jobs out there for you, but there is only one family. Family is the most important thing in life as they are there by your side through thick and thin. So if you think that though the money is good at this place of work but they are burdening you with work, in such a case you should not hesitate before you quit. For example its not every day that your dad celebrates his sixtieth birthday or your daughter starts preschool. Such memories are golden and you should try your best not to miss out on them. Though obviously not applicable to all, Maternity leave is one of the chief factors in creating a work-life balance for families. Often after having giving birth, women do not get adequate amount of paid maternity leave and so are forced to return to work leaving their infants in the care of a family member or at a day care centre. Having a baby is a big step for any couple and it does not mean that only a wife should have to consider giving up her job. Nowadays there are many fathers out there as well who are looking for alternatives to the regular nine to five jobs where they can either work part time or work from home such that they can enjoy the rewards of fatherhood and spend quality time with the family. No matter whether at work or at home you should not be afraid of sharing responsibilities with other people and delegating work. Remember that you are just one person, so you cannot focus on so many things at one time. People are never going to think any less of you if you distribute work among your team. When you delegate work then you are not only able to get the job done faster but you are also able to get an insight into how other people work. So in the work place delegate work to colleagues or juniors and at home give some duties to your children or spouse, you might be surprised with the positive outcome. These are some of the chief ways of how to balance work and life. Implementing these simple things in your life is not hard at all and it could really help you live a happy and stress-free life.